Everyone's favourite Easter Bunny! This super cute white Easter bunny is on a blue background which makes it even more fun and bright. 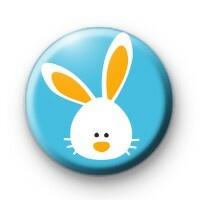 This is one of our cutest Easter bunny badges & is really popular every year. These Easter badges make great Easter gifts & look great pinned to your work clothes & school uniforms during the Easter school holidays. These are also popular with schools & teachers & are great to hand out to your pupils. These make great alternative Easter gifts, especially if you are trying to stay away from chocolate eggs.